An Amtrak train crashed in the American state of Washington Monday. At least six people died. The train was making its first-ever run along a faster route on existing railroad tracks. Seventy-eight passengers and five crew members were on the train. The train was traveling at a speed of 128 kilometers per hour when it went off the track and fell down to a busy highway below. The crash occurred about 64 kilometers south of Seattle. Local police said the falling train struck vehicles on Interstate 5. Several drivers were injured. Officials said they expect the number of dead to rise. Chris Karnes was on the train. He said the only part of the train that remained on the tracks was the rear – or back – locomotive. Many train cars could be seen hanging off the overpass. An official told The Associated Press that the train may have struck something before going off the track. The official was not permitted to discuss the investigation publicly. The possibility that the crash was caused by something on the tracks concerns officials about the risk of high-speed trains crossing busy streets. The mayor of a town near the crash site had warned about the danger of such an accident at a public meeting just two weeks ago. U.S. President Donald Trump used the deadly crash to call for more infrastructure spending. 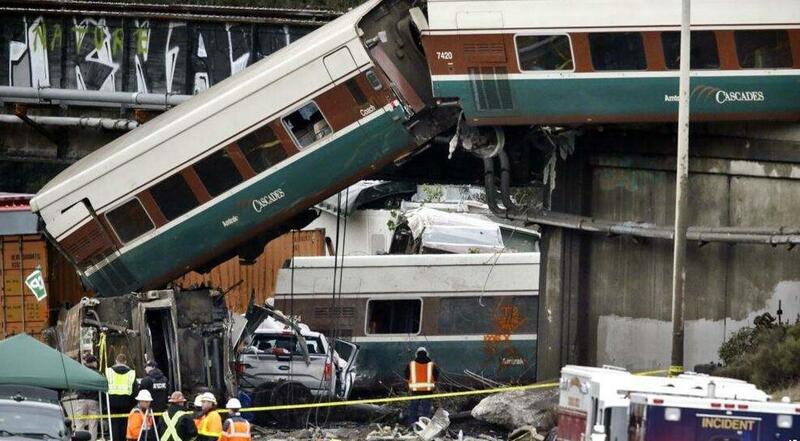 He tweeted, "The train accident that just occurred in DuPont, WA shows more than ever why our soon to be submitted infrastructure plan must be approved quickly." The train was making the inaugural run on the new route designed to speed up service between Tacoma, Washington, and Portland, Oregon. State transportation officials said testing on the track was completed back in January and February, well before the crash on Monday. How fast are trains traveling? The Amtrak Acela Express – which connects several eastern cities - is the fastest train in the United States. It can travel at a top speed of 241 kilometers per hour. European countries including Germany, Italy and Spain have trains that can travel more than 320 kilometers per hour. The fastest trains in the world are found in Asia. Chinese media reported that the Beijing-to-Shanghai train can reach speeds of up to 350 kilometers per hour. A deadly crash between two bullet trains in 2011 led to China limiting train speeds to 300 kilometers per hour. The fastest non-operating train in the world is still undergoing testing in Japan. The train, a Japan Railway maglev, has reached a top speed of 603 kilometers per hour. Our country is planning to lay new railroad track. The sun's rays can penetrate water up to 10 feet. The old lady fell down in adoration before Buddhist images. She went off to bum round the world with a boyfriend. 5.The train was making the inaugural run on the new route designed to speed up service between Tacoma, Washington, and Portland, Oregon. He pushed a lever that speeded up the car. You notice that your breathing has speeded up a bit. 6.Many train cars could be seen hanging off the overpass. Some riders hang off the side off their saddles. Don't foget to say goodbye to others before hang off.